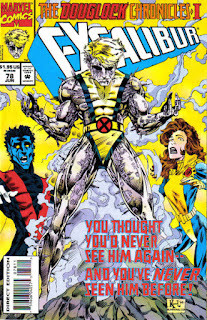 After appearing briefly on the final page of the previous issue and making a cameo appearance in Uncanny X-Men #313, this issue marks the first full appearance of Douglock, looking more or less on-model with how he'll be portrayed moving forward (with Douglock integrating a version of the classic New Mutants training uniform into his look). 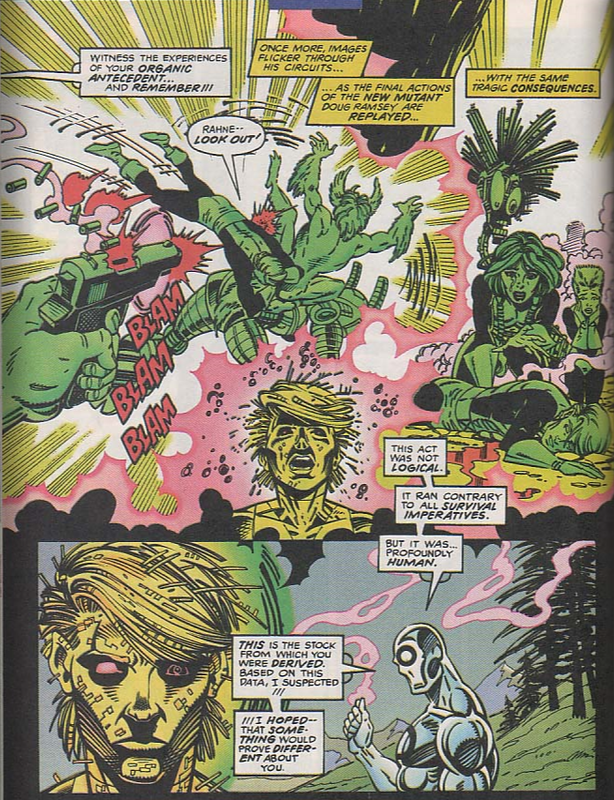 It still remains a question as to whether he is a resurrected techno-organic Doug Ramsey, a resurrected Warlock in Doug's form, or some combination of the two, but the first option is the most heavily implied this issue, as amongst other things we're given an overview of Doug's death. Given her history with Doug Ramsey, Kitty is appropriately floored when coming face-to-face with Douglock for the first time. 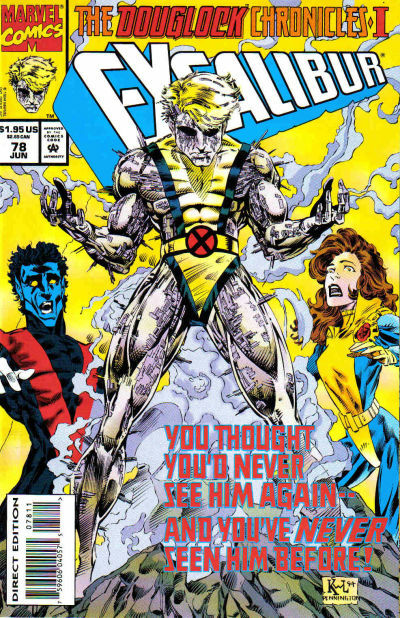 After a few issues' worth of setup in other books, Professor Xavier arrives on Muir Island this issue in order to help Moira research a cure for the Legacy Virus. Moira, meanwhile, is acting strangely; it will shortly be revealed that she has become infected with the virus, explaining her behavior here. 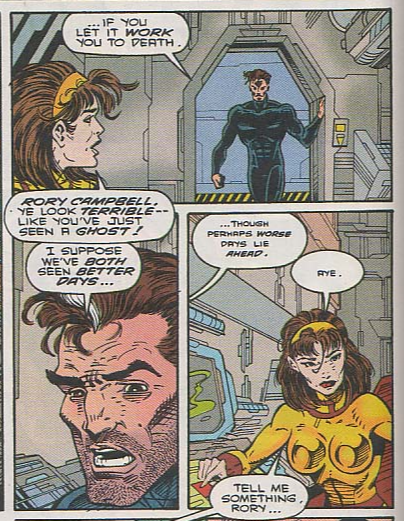 Rory is carrying around his own angst, as he continues to worry about becoming Ahab and making cryptic comments about the future as a result. 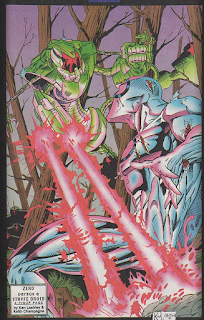 This issue is padded out with a Zero vs. Stryfe Droid pinup, which is pretty gratuitous even by "padded out with a pinup" standards. Chris Cooper once again scripts a plot, this time from Scott Lobdell on his own, while art comes John Royle, an artist I don't think I've ever encountered outside this issue. 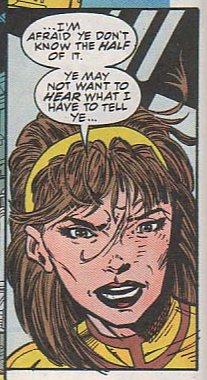 The "something strange is going on with Kitty's dad" subplot is kept simmering as Kitty calls her mom and confirms she hasn't heard from him recently. Well, this is better than last issue, but just barely. 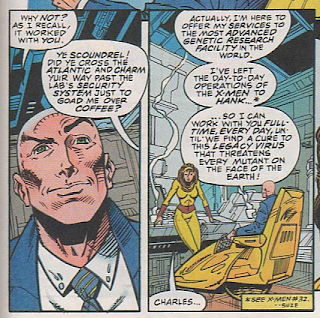 And to the ongoing detriment of the series, what makes it better has very little to do with Excalibur itself, and more to do with things happening on the periphery: Xavier arriving on Muir Island to help research the Legacy Virus (and Moira's ominous hints) help connect the story to current events in the larger X-universe, while the exploration of Douglock's existence (and the question of whether or not he's Doug Ramsey) connects the story to the history of that universe. 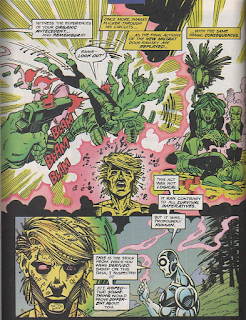 But all of that does little in terms of developing Excalibur's characters or its identity as a series, especially since the least interesting characters in this issue are Ethereal Meggan & Mumbo-Jumbo-spouting Britanic (which, in an issue with Zero, of all characters, spouting on about the power of humanity & emotion, etc., is saying something). This isn't a bad start to what will turn out to be a halfway decent story, but very little of what makes that the case has anything at all to do with the series' title characters. Next week: Caliban returns in Uncanny X-Men Annual #18, the Shi'ar return in X-Men Unlimited #5, and Senyaka returns in Cable #12. I don't know. I'm torn over whether I want Zero as the silent Stryfe henchman teleporter android or this... new age... soul searching... nonsense... thingy. 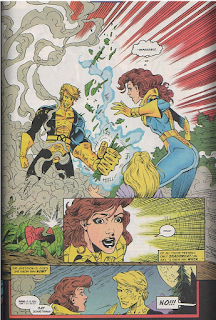 It's inherently wrong that the Liefeld version is the less 90's option between the two. Wrong I tell ya! Not familiar with John Royle myself either, but the art’s definitely nicer than Lashley’s has been — case in point: the disproportionately large heads on this issue’s cover.